Want to enjoy buffet in a cruise? More than what Chocolate Hills, Loboc River cruise is great way to experience one of the best tourist spots in Bohol, Philippines. Seafood, local dessert menu, get to listen to a serenade and enjoy the sight seeing of the whole cruise over this exciting river like a revelation of it's rich history on how it came to be. I can just imagine how long it will take to travel the whole straight of the Loboc River cruise. From here in Manila as I see it by watching Dolce Amore teleserye using our ABS-CBN TV Plus black box, I get so excited to go on a long-time planned trip to Bohol. It will be soon, I know and it will be perfect and very happy which I will share on this very page in the near future. Enjoying any tourist spot or special place during a vacation or travel in the Philippines is all about preparation. Although many would prefer the surprises that being unprepared offers, we cannot rule out the fact that in any travel, preparations always make a perfect place just right for the right time and make the right people out of us. With this, below is a guide map and how to get there at the port to ride the floating restaurant. Our family hopes you enjoy your trip to Bohol, Philippines in the Visayas region. To get to Loboc River cruise port and go onboard its floating restaurant, from Tagbilaran airport strip, it is about 41 minutes travel if there is no traffic. But there is actually another way to get there which the better and more adventurous and scenic travel along the shores of the historical Baclayon Church and Loay, Bohol taking the route of the Circumferential Road. The latter is a 44 minute travel by car and that is just a mere 3 minute difference but with a more fun trip. If you are asking when is it best to go to Bohol to enjoy the floating restaurant, other tourist spots like the Chocolate Hills and the Loboc River Cruise, I personally recommend going during the summer months in the Philippines which is from March till June. After that, rain starts to fall and you'll definitely be turned off of the unlikely weather in the Philippines after June. 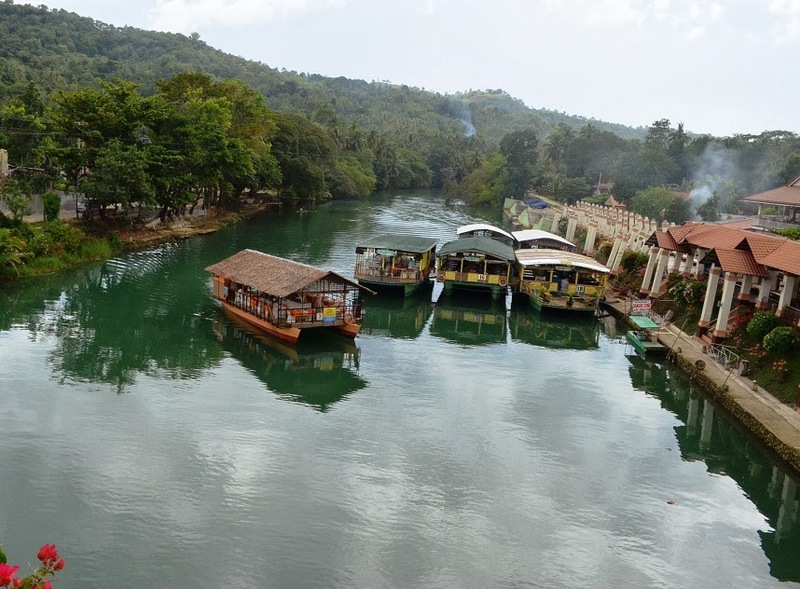 Reminder: Many people and tourists also call and refer to the Loboc River cruise as the Loay River cruise because you are actually taking the tour along its interior road and take off point is from the Loay Port. The route of Loboc River Cruise is actually just like any kayak trip one can take. It is a slow moving cruise along the river of Loay locality. Just like any other rivers in the Visayas, the cruise is no short than breath-taking but common to the locals who frequently take a peek and enjoy it just like any other travels in the Philippines. By estimates using Google Map road trip, the travel by road of the Loay Interior Road takes about 1 hour 11 minutes but judging from the length of the river, for a cruise to take out the whole span, it might probably take more than 1 hour 30 minutes to finish. I am not so sure where the cruise ends but if it is coming from the Loboc church and river watch area to the commercial port in Loay, it might take maybe up to 2 hours. Looking at the available photos online, I saw some pictures that indicates there were actually about 6 floating restaurants touring the whole Loay River for the cruise visitors and tourists who want to enjoy the sight seeing in the river while dining in buffet style Filipino food recipes (which may at times include native and local Boholano dishes) with fresh coconut juice, seafood and more. At night, the river seems like paradise. Apart from live music and performance from local Bohol cruise resident musicians and singers, the buffet food offer is one of the best attractions when in this cruise. We have searched and scoured online blogs and websites that featured reviews of the floating restaurant and below are some of the ideas of what kind f food they give to tourists who embark on an unknown journey to the straits of Loboc River. Below are just some to give you, our readers an idea. For a lunch buffet at the floating restaurant, back in 2013, it will cost you about Php 450.00 that a Php 300.00 Philippine pesos for the buffet food and Php 150.00 for the cruise trip fee. Food includes the usual pancit, soup, barbecue, fresh buco juice, bananas and native Pinoy cooking dishes. While on this trip, expect to say that this is what it is about the Philippines that foreigners love -simplicity and uniqueness.